Volatility – and not just of the market variety – is on the minds of the chief executives, financial titans and world leaders wrapping up their World Economic Forum chats in Davos, Switzerland. While it’s true that swinging stocks, bonds and commodities are front of mind at the elite gathering, the temporary denizens of Davos are themselves something of a living display in human volatility. Consider the fortunes of the bank bosses who hosted receptions in the Alpine town’s posh hotels and spent time in the closely guarded congress center a year ago. Anshu Jain is no longer the boss of Deutsche Bank. Nor do Peter Sands, Antony Jenkins or Brady Dougan lead Standard Chartered, Barclays and Credit Suisse, respectively. The European bankers, at least, left under less worrisome circumstances than Andre Esteves. One of last year’s hottest tickets was an audience with the Brazilian banker extraordinaire. Not so much this year: The BTG Pactual boss was arrested in November for allegedly obstructing an investigation into oil giant Petrobras. Brazil’s wild ride also claimed other high-profile Davos scalps. A year ago, President Dilma Rousseff dispatched her new finance minister, Joaquim Levy, on whom many pinned hopes for Brazil’s recovery. He lost his job – and presumably his invite – when he bowed out in December. His replacement is doing the rounds this year. Some other regulars are conspicuously absent. Alan Clark, the gregarious head of SABMiller, is probably too busy prepping the sale to AB InBev to host the Italian-themed Peroni party of years past. Yahoo’s Marissa Mayer also appears to have taken a break from Davos. Her duties as a new mother of twins may be more a factor than Breakingviews readers predicting her most likely CEO to be out of a job in 2016. Each departure ushers in debutantes, of course. The replacements at Barclays, StanChart and Deutsche – Jes Staley, Bill Winters and John Cryan, respectively – made the trip in their new guises. Even BTG is represented. And Tidjane Thiam co-hosted a glittering dinner for Melinda Gates in the Credit Suisse pavilion where Dougan last year held court. This year’s list will include many taking a Davos bow, unwittingly or not. U.S. Vice President Joe Biden is one. Others like Ivan Glasenberg, the boss of embattled Glencore, may be more the result of distress. The good news, as former Barclays-boss-turned-African-entrepreneur Bob Diamond can attest, is you can sometimes return. 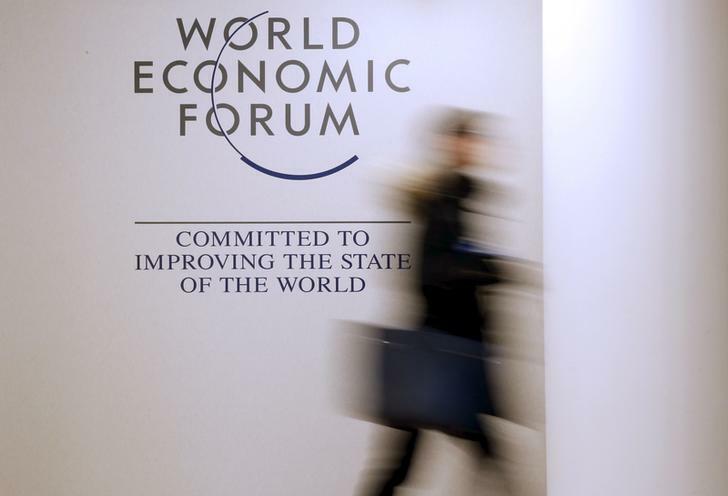 A person passes by a logo of the World Economic Forum (WEF) in the congress centre ahead of the Annual Meeting 2016 of the WEF in Davos, Switzerland, January 18, 2016. The 2016 World Economic Forum Annual Meeting is being held in Davos, Switzerland, from Jan. 20 to 23.